While the South Korean film Mother begins and ends with a character dancing, all is certainly not merry in Bong Joon-Ho’s 2009 thriller. The film centers on the plight of an unnamed single parent (Kim Hye-Ja) who is raising a mentally-challenged, twentysomething son named Do-Joon (Won Bin). When a young girl in town turns up dead, a key piece of evidence points to Do-Joon as the killer. Hauled in for questioning by the local police, the mentally-handicapped young man signs a confession (offscreen, I should add). Presented with an open-and-shut case — a key piece of evidence tying Do-Joon to the crime, a credible witness, and now an illegally obtained confession (at least in US terms — not only is he mentally handicapped, but the cops physically threaten him) — these overworked, totally unethical “public servants” decide they’ve found their man and refuse to explore other angles. It may be completely understandable, but that doesn’t make it right. 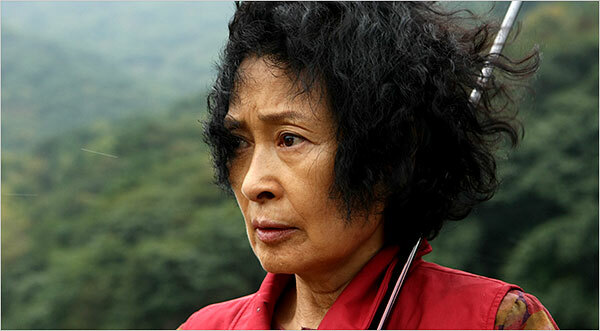 Do-Joon’s mother, convinced of her son’s innocence, launches an informal investigation of her own. Could the real murderer be Jin-Tae (Jin Goo), Do-Joon’s supposed best friend who has a knack for getting her son into trouble? Perhaps the rich men that Do-Joon and Jin-Tae tangled with early in the film are somehow responsible? Or is there a deeper conspiracy at work? In the end, our heroine will find the truth, no matter the cost. 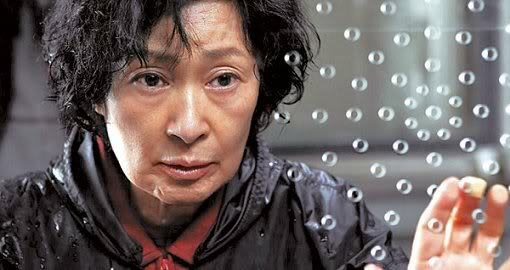 Like a lot of socially conscious Korean films, Mother works as a commentary on the “haves” and the “have-nots,” as it begins with an incident seemingly unconnected to the main plot: a fancy car hits Do-Joon, much to his mother’s horror, and drives off, the perpetrators fleeing the scene of the crime. Shaken up, but unharmed, Do-Joon and Jin-Tae pursue the car to a nearby country club. As it turns out, the perpetrators are all older, well-respected university professors dressed in lily-white golfing regalia. The arrogance of these men, not only during the hit-and-run accident, but in relation to their behavior during police questioning speaks volumes about class positioning in South Korea. But that opening sequence is only an appetizer for the kind of class conflicts that emerge later in the film. When Do-Joon is arrested, his working-class mother scrapes together some money to hire Mr. Gong, the best lawyer in the county. Unfortunately, the attorney is a busy man, who barely talks to her and speeds out of his first meeting with Do-Joon after receiving an “important” phone call. In a surreal encounter with Do-Joon’s mother in a seedy karaoke bar, Mr. Gong — flanked by two rich friends and a bevy of slutty hostesses, tells her the best she can hope for is getting Do-Joon sentenced to a mental institution. Throughout these sequences, there is the sense that money may seem to buy justice or at least give her a better shot at it, but the fact that she has less money to spend means she’s not in good hands at all. How serious does her attorney really take her case? Money can buy a “top” lawyer, but not necessarily a compassionate one. To complete this critique of the divide between the rich and the poor, Bong Joon-Ho gives us “Mother” herself: noble, self-sacrificing, and undaunted by numerous (and I mean numerous) setbacks, “Mother” is the populist heroine par excellence. The film could have succeeded as a mother-son detective story with appeals toward the “common people,” but Bong Joon-Ho actually has a few more tricks up his sleeve. The film takes some seriously intriguing detours, complicating matters as certain sins of the past converge with the present and future. In the end, it’s not just about the “haves versus the havenots” anymore — it’s about the havenots hurting each other — financially, emotionally, and physically, too. And that’s what I appreciate most about Mother. Even leaving the class warfare aspect aside, the film can be appreciated on a lot of different levels. On the most basic premise of genre, it initially plays like a straight-up amateur detective story, and it certainly can be appreciated on those terms. In regard to thematic content, Mother is also a universal (I use that word cautiously) tale of a mother’s love for her child and the lengths she’ll go to protect him. But what’s fascinating about Mother is that after setting up a seemingly clear-cut structure and a straightforward theme, it proceeds to undermine those two narrative aspects considerably. On the one hand, the film becomes a postmodern revision of the detective story, and on the other hand, while it may be indeed be an affirmation of mother-son love, it’s also a dark critique of that relationship as well. If you’re trying to extract a message of family values from the film, you’ll be hard-pressed to do so without purposefully extricating it from some far darker material. On this note, to what degree, I wonder, is Mother meant as a commentary on the parent-child relationship in contemporary Korean culture? When one thinks of the lengths to which many Korean parents go to provide for their children, perhaps even to the point where their offspring are uncritically treated as little princes and princesses, regardless of their true character or behavior, one begins to wonder if this parallel begs further investigation. While Do-Joon is mentally challenged and thus in need of extra care from his mother, in what ways is he a metaphorical extrapolation of an entire generation of young people, particularly Korean males? After all, he may be mentally dense, but he is also handsome, prone to trouble, financially parasitical, and always in need of being bailed out by his hapless mother. The fact that he’s played — quite well actually — by Won Bin, who has matinee idol good looks seems to be no accident. When the film introduces a character with actual Down syndrome late in the proceedings, the contrast between him and Do-Joon is lost neither on our protagonist nor the audience. In the end, I would assert that the film is about all these things plus the power of memory — what we choose to remember and what we choose to forget. Whether you like or dislike the film, Mother will not fade from your memory. This is a haunting, expertly composed piece that will leave even those who admire it both unsettled and disturbed. For another take on the film, read a review of Mother from LoveHKFilm.com’s very own Kevin Ma here. This entry was posted on Monday, September 20th, 2010 at 10:46 pm	and is filed under Bong Joon-Ho, Mother, Korean cinema. You can follow any responses to this entry through the RSS 2.0 feed. You can leave a response, or trackback from your own site. Ok, I think you are dead on: about the class warfare, the extreme mother-son dynamic, and especially about memory. I would add that it plays with the idea of mentally-challenged. I felt there were definitely times where Do-Joon wasn’t as clueless and hapless as here appeared to be. And let’s not forget the how modern-day forensics gets pimp-slapped by somebody’s mama’s detective work!